The veteran six piece has added another music video to their repertoire. This one is off of their most recent album Living Things and can be found here. 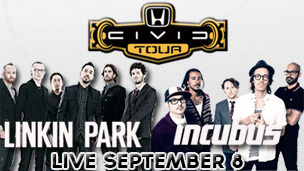 The band will be streaming their concert with Incubus live from The Home Depot Center in LA on September 8th via AXS TV. Papadosio realeases their new album: T.E.T.I.O.S. Blink-182 is Back In the Studio! The Head and the Heart Release New Video! Linkin Park or Linkin Pop?